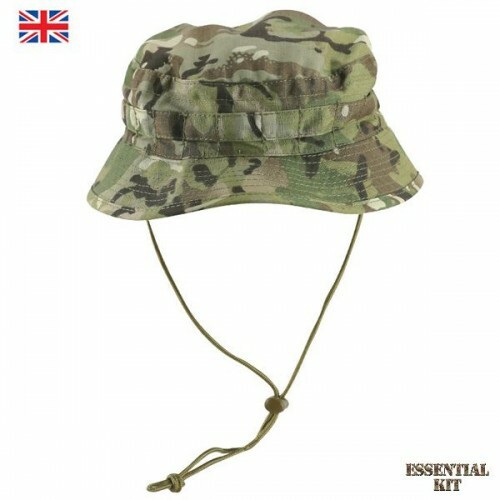 British Special Forces tailored small brim 'Boonie' style bush hat from Kombat UK. BTP (British Terrain Pattern) camouflage - has been designed to compliment the British Army MTP issue and is compatible with Multicam. Ideal for Cadets, Scouts or any other outdoor activities. Easily folded or rolled into a pocket size. PLEASE NOTE: These hats are designed to be very fitted, therefore if you prefer a slightly looser fit please take this into account as you may need to order one to two sizes larger than your usual size. e.g. if your head measures 58cm you will need to order a 59cm or 60cm hat. The sizes given are the maximum headband width, if in doubt please measure your head around the widest part just above the ears.